If you are a long range paintball player and you have been wasting shots with guns that can’t reach 150 feet, then you are in the right place. Short and mid-range paintball markers lose accuracy over 100 feet and even then the ball may just bump on your target instead of breaking on it. With the longest range paintball gun, your shots will be more straight and accurate and they will easily travel a longer distance. What is more, the long distance paintball markers in our review are customizable, thus giving you that precious edge in the game field whether you are a pro or amateur. Without further ado, here is a review of the best long range paintball guns that you should buy in 2019. Coming up after the review is a buyer’s guide for this type of paintball markers. Tippmann US Army Alpha Elite is in a class of its own as a paintball gun and it is a favorite choice for beginners and pros of all types of games; woodsball, speedball and recreational paintball. Reliability and performance of this gun is simply army grade, yet it is one of the most affordable for this quality. You can upgrade the marker’s performance to a beast in the field, by using accessories such as electronic response trigger, semi automatic e-grip, and a cyclone feed system. The marker package includes a GXG XVSN mask complete with anti-fog lens, 3Skull 200rd hopper, 6+1 harness, 6 heavy duty clear tubes, a red dot sight and a 3Skull folding foregrip. The long distance paintball gun also comes with a detachable M-16 style shroud with a lower Picatinny rail system where you can attach aftermarket add-ons such as tripod stand or flashlight. The magazine has an inbuilt tool storage section so that it can double up as a detachable tool storage kit. The marker is effective over 150 feet, quite shorter than other long range paintball guns but you will love the military grade quality that will never disappoint you. Tippmann X7 Phenom is a low price but powerful paintball marker that will appeal to you if prefer mechanical firing, but with the efficiency of FlexValve technology and the ability to upgrade to electronic firing. The intermediate player paintball marker incorporates the FlexValve technology, letting you enjoy incredible air efficiency below 300 PSI. With this, you can easily fire 1,400 shots from a 4,500 PSI reservoir. The Spool Valve technology also minimizes recoil once the trigger is pulled, thus tremendously improving accuracy. The stylish military designed gun is the perfect choice for woodsball and milsim games and it can be easily converted into a variety of rifles and machine guns. The electronic form of this gun incorporates specialty features such as the ability to select manual or electric modes of shooting, compressed air pressure or CO2 firing. A robust cyclone feed system can load up to 20 balls per second and the front and rear sights are detachable so that they don’t obstruct your targeting. Although the average range of this marker is 150 feet, the extreme reliability every time you pull the metallic trigger is simply invaluable. The Tippmann TMC Magfed marker tops the best long range paintball gun list due to its powerful magazine fed system and customizable optics that can enable you to fire over 300 feet. Tippmann TMC is a dual feed system that includes two 20-round spring driven magazines as well as hopper feeding option from a dummy magazine. A four sided Picatinny rail system allows for tons of customization options as well as an agile inbuilt bolt system. The sturdy but comfy rubber grips snuggly fit into your hand such that it feels like you have a glove, and yet it is highly non-slip. A fully functional charging handle also ensures that the marker is safely cocked while you attach the air supply and when you are firing. An easy-to-pull trigger allows you to effectively reach 150 ft but with customized optics, you can even exceed 300 ft. Finally, at just $200, this quality gun tops the best paintball guns for the money. Whether you are a beginner or a pro and you are looking for an easy-to-use but high performance rifle, then Wrek Project Salvo is for you. You don’t have to worry about carrying the 6lbs toy on your shoulder as it features an all-metal bipod. Its legs are extendable to give you the perfect platform for long range shooting. You can also switch the bipod between guns as long they have the Picatinny rail system. The high-performance gun has its stock barrel upgraded to a J&J Performance 16-inch ceramic barrel. The interior surface is ultra-slick, which helps improve the efficiency of air flow, improve accuracy while making the marker almost noiseless. You know you need a paintball mask to protect your face, nose, ears and eyes but for some, clarity is affected. However, this gun comes with a long lasting all-metal riser rail that lets you use any kind of optics. This gun is truly a king of long range shooting as it features a rugged large tube red dot that provides you a larger than average field of view. You can zoom in the adjustable red dot to create a window perfect for capturing and tracking your target, even with your mask on. It is also a fast firing gun and it can reach 300fps. The velocity is actually adjustable between 250fps-300fps with both CO2 and HPA. Its effective range is 200 feet. Tippmann Cronus is a high-impact paintball designed to hold up to rough tactical battles in the field until it remains the last man standing. A reliable in-line bolt system helps you avoid chopping paintballs when you fire. The tactical gun combines high performance in an incredibly durable milsim body. The body maybe high-impact and compact but the handle has a soft rubber grip so that you don’t end up with blisters. The marker features a mock silencer with a front sight, 6 position collapsible and folding Stock, carry handle and vertical grips that all combine to give a complete military look. Four Picatinny rails allow for a variety of customization and combining this with its user friendliness makes this rifle a perfect choice for beginners. The best long range rifle can fire using either CO2 or HPA and it can reach a shooting speed of up to 300 feet per second. The effective shooting range is 150 feet. 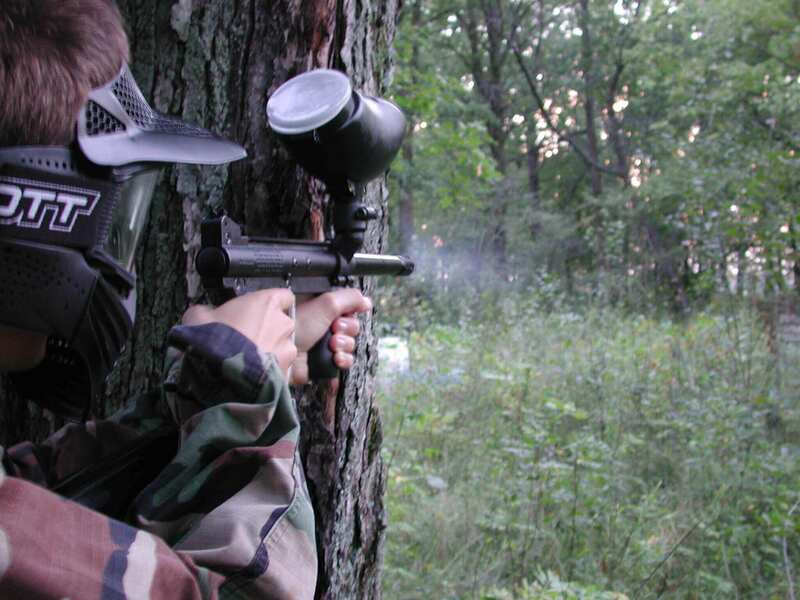 Several factors affect a paintball marker’s shooting range, such as the gun’s shooting speed, the barrel length, and the weather condition. All in all, a higher power paintball marker will help overcome aerodynamic drag on the ball enabling it to go a longer distance. Three terms describe a paintball gun’s shooting distance, namely, effective, safe and absolute range. The effective range is the distance the paintball can travel and still break up against your target, instead of just bumping on it. Most long range paintball guns have an effective shooting range of 150 feet and beyond this, it’s likely to be a miss because the ball won’t break upon hitting its mark. The safe range is a range of controlled speed such that the paintballs can be shot at a velocity safe to the opponents. Breaking against your aim is not the only thing to achieve; you need to avoid hurting your target. Long range paintball guns such as Tippmann X7 Phenom or Wrek have a max safe velocity of 300 fps. The absolute range combines the paintball’s durability with its velocity, meaning the longest distance it can reach. Long distance paintball guns have a maximum reach of 300-500 feet. While a longer barrel does not mean that your shot will be more straight and accurate, upgrading your stock can help you aim better and thus easily hit your target. Ideally, your long range barrel should be at least 12 inches long and at most 16 inches. Beyond this length, increased friction inside the barrel will definitely reduce the paintball’s effective reach. You might be interested in long range paintball but you are a beginner and thus a rifle to add accessories will serve you better. This includes Picatinny rails where you can attach a flashlight. Removable parts such as detachable front and rear sights help you to get them out of your view if need be.